Willow Springs Mennonite Church, Tiskilwa, IL. Willow Springs Mennonite Church (Mennonite Church), located 4 miles south of Tiskilwa, Bureau County, Illinois, a mem­ber of the Illinois Mennonite Conference, was organized in 1836 as an Amish Mennonite congregation, the settlers having come mostly from Bavaria, Germany, plus a few from Butler County, Ohio. The Bavarians had first settled in 1835 in the Hennepin and Gran­ville neighborhood in Putnam County. After meet­ing in homes for 35 years the congregation built its first meetinghouse in 1873. This was destroyed by lightning in 1896, but was immediately rebuilt, and later enlarged several times. 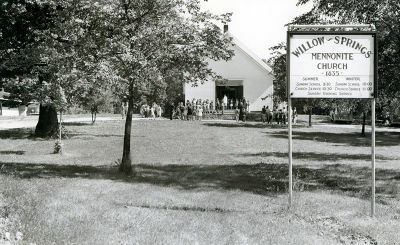 Three subsidiary groups have been formed from Willow Springs: Ohio Station in the north central part of the county 1840-1915, which never developed into a congregation; Sheffield in the western part of the county 1943-1950; and the Tiskilwa Mennonite Church (General Conference Mennonite), which was formed in 1911 when a group withdrew to join the Central Illinois Mennonite Conference. The first minister in the Hennepin community was Jacob Burkey of Hesse, Germany, who never lived in the Tiskilwa neighborhood. The Willow Springs congregation suffered for many years from inadequate and even absentee ministerial leadership and was not established on a sound basis until 1868, when Joseph Burkey, a minister at Tremont, Illinois, moved in and was ordained bishop a year later. His successor was C. A. Hartzler, a minister from Garden City, Missouri, who came in 1913 and was or­dained bishop a year later. C. W. Long was pastor in 1957, with a membership of 142. Weber, Harry F. Centennial History of the Mennonites of Illinois. Goshen, Ind. : The Mennonite Historical Society, 1931: 222-36. Location: 16621 Kentville Road, Tiskilwa, IL 61368. Bender, Harold S. "Willow Springs Mennonite Church (Tiskilwa, Illinois, USA)." Global Anabaptist Mennonite Encyclopedia Online. 1959. Web. 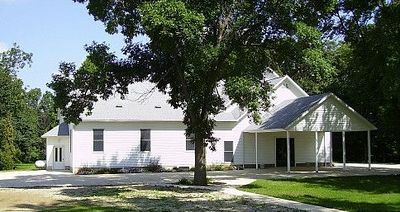 25 Apr 2019. http://gameo.org/index.php?title=Willow_Springs_Mennonite_Church_(Tiskilwa,_Illinois,_USA)&oldid=139532. Bender, Harold S. (1959). Willow Springs Mennonite Church (Tiskilwa, Illinois, USA). Global Anabaptist Mennonite Encyclopedia Online. Retrieved 25 April 2019, from http://gameo.org/index.php?title=Willow_Springs_Mennonite_Church_(Tiskilwa,_Illinois,_USA)&oldid=139532. This page was last modified on 6 October 2016, at 07:35.